U.S. President Donald Trump has nominated David Malpass for the post of the President of the World Bank. David Malpass had held senior roles in the US Treasury during the Ronald Reagan and George HW Bush administrations. He has also served as the Chief Economist at Bear Stearns Bank. Later he founded research group Encima Global and held a number of directorships at finance firms. 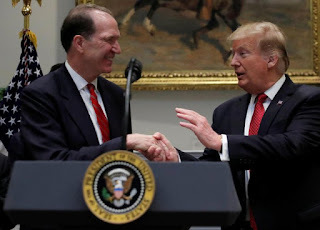 After the assent of Trump to the U.S. Presidency, Mr Malpass took up a senior role at the U.S. Treasury and was the undersecretary for international affairs. What is required in a World Bank President? A proven track record of leadership. Experience managing large organizations with international exposure, and a familiarity with the public sector. Ability to articulate a clear vision of the Bank's development mission. A firm commitment to and appreciation for multilateral cooperation. Effective and diplomatic communication skills, impartiality, and objectivity. Executive directors of the World Bank can nominate candidates for the post. The candidate must be citizens of one of the bank's member countries and cannot be a bank governor or executive director. Executive directors are expected to clearly communicate and define the nomination period. If there are more than three candidates, there will be a shortlisting process to narrow the field through an informal straw poll. The shortlisted candidates will be interviewed by the board and then the board will make a final selection through a majority vote. To win the presidency of the World Bank, a candidate must win approval from the institution's executive board, which has 25 members. The U.S. holds a 16% share of board voting power hence more often it is the U.S.-backed candidate gets elected for the post of the president. Q. Who has the U.S. President Donald Trump nominated for the post of the President of the World Bank?